Pharmacological analyses of acid-evoked pain in humans. Mean ± SE are shown for each data point. (a) Acids injected hypodermically into human skin provoke pain in a pH-dependent manner (n = 8). The subjects tested started to feel pain at approximately pH 7.2, and the degree of the evoked painful sensation was well correlated with the magnitude of acidification, with a saturation value at approximately pH 5.5. (b) Instant effects of an ASIC blocker, amiloride (ami. ; 200 μM) (n = 10). Amiloride treatment potently blocked acid-evoked (pH 6.0) pain. The vertical axis shows estimated pain values (*P < 0.01 vs. second pH 6.0 treatments). (c) Effects of a VR1 blocker, capsazepine (CPZ; 100 μM), on acid-evoked (pH 6.0) pain (*P < 0.01 vs. second pH 6.0 treatments) (n = 10). Simultaneous applications of capsazepine did not display any analgesic effects on the pH 6.0 stimuli. The capsazepine applications (pH 7.4) themselves provoked no significant pain. 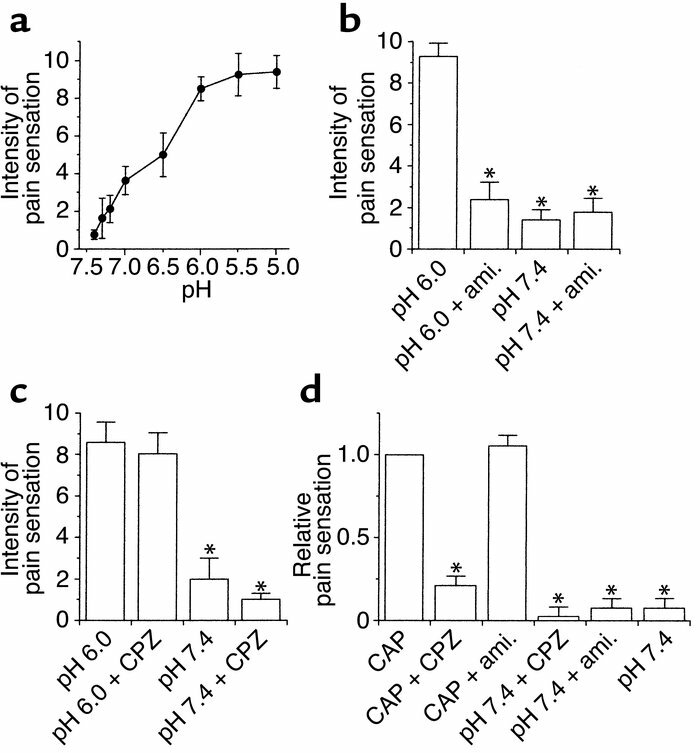 (d) In vivo effects of capsazepine (100 μM) and amiloride (200 μM) on 20 μM capsaicin-evoked (CAP; pH 7.4) pain in human subjects. Capsazepine potently suppressed the capsaicin-evoked pain in the subjects tested, whereas the amiloride induced no analgesic effects (n = 8). Data are plotted relative to the capsaicin-evoked pain (*P < 0.05 vs. capsaicin treatments).